With the massive rise of cybercrimes, security has become an integral part of the cybersecurity market. Especially with the unexpected rise of new viruses and malware, antivirus industry is seeing a rapid market adoption in the recent years. And the growing dependence on the Internet only escalates the issue to the further level. Today everything and everyone is connected through a common thread called the World Wide Web. It is fairly easy for cybercriminals to create a malware and spread it over the Web just like that and there’s almost nothing you can do about it unless you have a reliable antivirus software program installed on your system. There are several antivirus software suites and packages available out there specifically designed to deal with such malicious programs. The list is long, but the most popular ones are McAfee and Avast, both of which provide the best antivirus software suites for your security needs. We pit the two against each other to help you find the right one for your security requirements. McAfee is a major provider of cyber security solutions and one of the most popular names in the global cyber security market. Headquartered in Santa Clara, California, McAfee is a major line of defense for cyber attacks that provides all-around protection for your computers, endpoints, and networks from all kinds of security threats. The company was originally founded by John McAfee in 1987 as McAfee Associates and was later incorporated in 1992. The company became popular all of a sudden when the Michelangelo virus took the better of the cyberspace in the late 1990s creating a nationwide panic. McAfee came to the rescue which eventually led the company to its success. In 2010, McAfee launched a new service for SaaS providers named Cloud Secure, to provide additional security to their cloud deployments. McAfee is now part of the Intel Security division as a result of $7.68 billion deal announced in 2010 and finalized in 2011. Avast is a global cyber security company that aims to protect people’s right to security and privacy through its wide range of antivirus and security products. Headquartered in Prague, Czech Republic, Avast was founded by Eduard Kučera and Pavel Baudiš as a cooperative which was originally called Alwil and the name Avast is actually an abbreviation for “AntiVirus Advanced Set”, which the company owes its name to. In 1995, Ondřej Vlček wrote the company’s first antivirus program for Microsoft Windows 95. The company immediately had one more achievement in its portfolio after the Virus Bulletin awarded Avast in all of the testing categories. The company struggled a bit in the late 1990s after it changed to a freemium model. The name was officially changed to Avast in 2010. By 2015, the company had the largest share in the antivirus market. Today, Avast is one of the most trusted antivirus programs in the world. – McAfee is a major provider of cyber security solutions and one of the most popular names in the global cyber security market. Headquartered in Santa Clara, California, McAfee was founded by John McAfee in 1987. Avast is a global cyber security company that aims to protect people’s right to security and privacy through its wide range of antivirus and security products. Headquartered in Prague, Czech Republic, Avast was founded by Eduard Kučera and Pavel Baudiš as a cooperative which was originally called Alwil and the name Avast is actually an abbreviation for “AntiVirus Advanced Set”. – McAfee is a major line of defense for cyber attacks that provides all-around protection for your computers, endpoints, and networks from all kinds of security threats. McAfee has comprehensive cyber security solutions from the basic protection to advanced malware protection. Avast also offers a diverse range of antivirus suites and software packages with advanced security features and extra utilities for better security and protection against all sorts of malicious programs, Trojans, viruses, etc. Both McAfee and Avast are neck and neck when it comes to malware protection. – McAfee antivirus products are designed to reduce system impact while actively scanning for viruses. They are one of the best products at preventing infections and their impact on system performance, thereby consuming as fewer resources as possible. Avast, on the other hand, is relatively less light on consuming system resources, thereby affecting system performance. McAfee is also better than Avast in terms of memory management which contributes significantly to the overall performance of the system. McAfee is a clear winner on the grounds of resource usage. – While both McAfee and Avast offer freemium models which provide all the basic features for a limited period of time, you have to pay more to enjoy the premium features that include advanced malware protection, social media protection, system optimizer, and more. McAfee’s basic plan costs $40 a year for a single system, while for up to 10 devices, the Plus program costs $60 a year. While the basic plan of Avast costs almost the same as McAfee’s, the premium plans are relatively on a higher side. So, McAfee’s security products are somewhat cheaper than that of Avast. While both McAfee and Avast work seamlessly when it comes to home users, McAfee is quite the preferred choice for enterprise level security, providing advanced protection against all kinds of malicious threats. This is mostly because McAfee is now a subsidiary of Intel Security division, its focus is more on enterprises. Avast, on the other hand, is geared towards home users. Despite what each of them claims or how good they are in terms of security and protection, they have their fair share of performance issues and shortcomings which really depend on a lot of factors. Sagar Khillar. "Difference Between McAfee and Avast." DifferenceBetween.net. 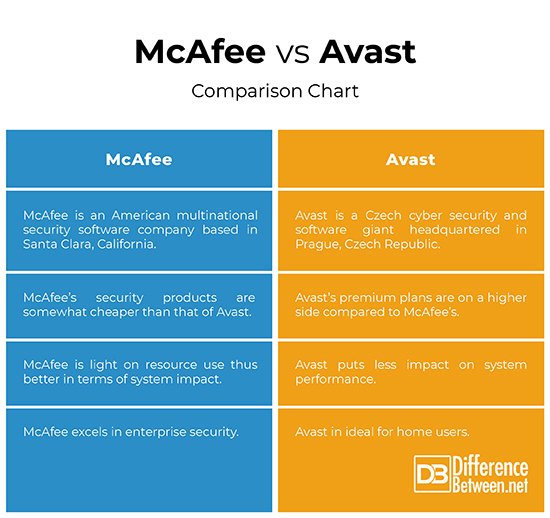 April 4, 2019 < http://www.differencebetween.net/technology/difference-between-mcafee-and-avast/ >.